LOGAN – She thought she had come up just short in the biggest track and field meet of her career. Utah State University junior Cierra Simmons crossed the finish line in the 3,000-meter steeplechase at the 9:49.33 mark at the NCAA Track & Field Championships. It was a new personal best and school record, but she felt some disappointment. She was lying on the ground, exhausted, mistakenly thinking she had come short of achieving first team All American. That All-American honor is given to the top eight finishers in each individual track and field event. Simmons was in the sixth spot entering the final lap, but fell behind and struggled to catch back up. Simmons shortened the gap between her opponent but wasn’t able to overtake her. It wasn’t until Boise State’s Allie Ostrander and New Mexico’s Charlotte Prouse found her after the race that she learned the good news. 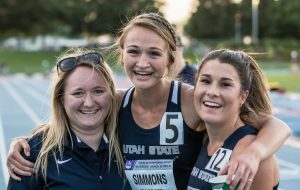 In addition to becoming an All American, Simmons’ finish gave the USU women’s team a point in the overall standings, making it just the fourth time in history the Aggie women have placed at the national level, and she isn’t done yet. Simmons still has another year of eligibility left; another year to improve and compete. USU head cross country coach Artie Griggs believes there is more to come. Simmons didn’t expect to reach this level of accomplishment, and said college running wasn’t a part of her plan. She was looking forward to studying at USU, but hadn’t been offered a spot on the team. That changed when she came to campus for a high school track meet and caught the attention of Aggie coaches. It was during the meet that Simmons’ former high school opponent and current teammate Tylee Newman-Skinner, who had already committed to USU, told distance coach Steve Reeder about Simmons. All-American status was far from Simmons’ mind when she joined the team in 2014. She recalled others talking about a former USU All American from the women’s team, but remembers saying that it “would be cool for whoever does that.” She didn’t think it would be herself. It wasn’t until the 2016-17 season when she started to see her own potential. Simmons had been away from competitive running for almost two years as a missionary for the LDS church in Florida. The cross country season went well, but the track season started with a record-breaking performance. 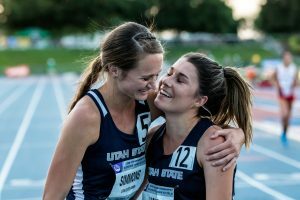 Her first steeplechase race after returning to USU was a personal best and a school record. People started to notice, and the talk started. Simmons credited a lot of her success to coaches, who, according to Simmons, believe in their athletes and help the athletes have that same belief in themselves. She said taking two years off from training to do missionary work didn’t hold her back, but that the break helped. Simmons wants to keep qualifying for big races and improve her time, but most of her senior year goals involve her teammates. She doesn’t want an Aggie making trips to nationals to be a surprise. She wants to be the norm. Simmons said the support she’s received has been a game changer.